With the large building and expanse of open fields, IronGate Equestrian Center can transform into the ideal wedding venue from an intimate casual affair to a larger wedding event. The entire property can be utilized for both ceremonies and receptions and can accommodate up to 1,600 guests depending on the style of wedding. There are three different options for the wedding ceremony including the indoor main arena, a picturesque outdoor bridge area, as well as an idyllic pasture setting. 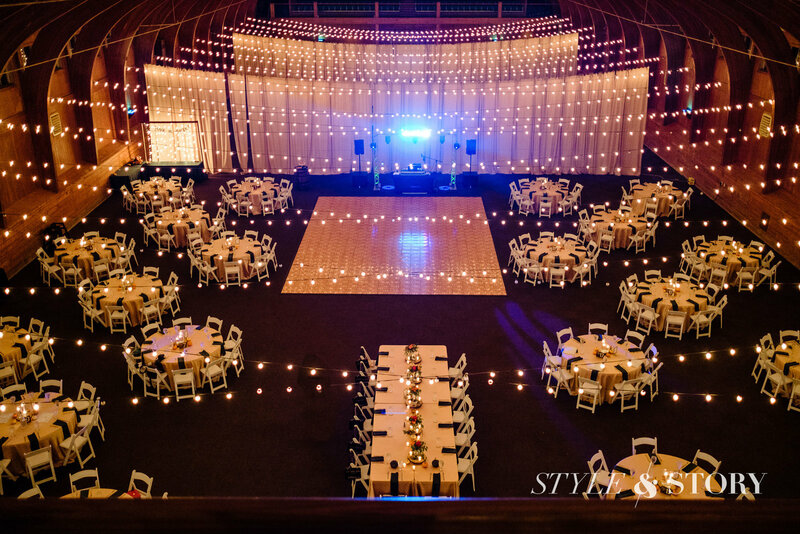 The indoor arena is a quaint setting with rustic wooden features, floor-length drapes and twinkling cafe lights. A short stroll over a stone bridge brings guests to the outdoor bridge area that provides the perfect natural setting among the trees and streams. The pasture setting makes use of the canopy of trees that envelop the shaded area. All ceremony areas can utilize theater or bench-style seating. Wedding receptions can also take place in one of three areas. The indoor main arena is ideal for any size wedding and can accommodate up to 900 table-seated guests. The outdoor pasture is a blank canvas for couples looking to create their dream wedding with the ability to set up any size tent. The outdoor bridge area can also be set up to host an intimate outdoor reception for a smaller group, using farm tables and rustic benches. In addition, IronGate Equestrian Center has multiple areas to host a pre-dinner cocktail party that includes the Chestnut Den, Perlino Bar or one of the two balconies that overlook the property. Bridal suites are also available on the second and third floor and include bedrooms, private baths and a kitchenette. According to WeddingWire, one of the ceremony sites start at $800 during peak season and $550 in the off-peak months. The reception site fee starts at $5,000 during off-peak season and $6,500 in season. Prices include use of the main barn, cocktail areas, bridal suites and balconies, as well as tables and white padded chairs, linens, candle centerpieces, cafe lighting and a 21 x 36-foot dance floor. An on-site wedding consultant is also included in the pricing. Additional fees are applied to amenities such as a larger dance floor, uplighting, staging and outdoor event tents and set-ups. IronGate Equestrian Center also allows caterers from their approved list, which is available upon booking. Entertainment and other vendors can be hired at the discretion of the wedding couple. Originating as a private training center, IronGate Equestrian Center transformed into a dual purpose venue in 2014. Used concurrently as both a world-class equestrian facility as well as an upscale event center, IronGate Equestrian Center is considered exceptional and unique and is sought-after in both facets of its use. The IronGate Equestrian Center has become known for its stunning and serene surroundings with an abundance of green pastures and a scattering of babbling brooks. A rustic stone wall guides guests over wooden bridges and through a rolling hillside onto the meticulously-maintained grounds while white farm fences border the property, adding to the rustic charm. The 40,000 square foot barn is the property's centerpiece, with its classic white-washed wood siding contrasting with the pitched green roofs adorned with copper cupolas. The barn captures the essence of the country setting with exposed wooden beams that soar above the three-level building. 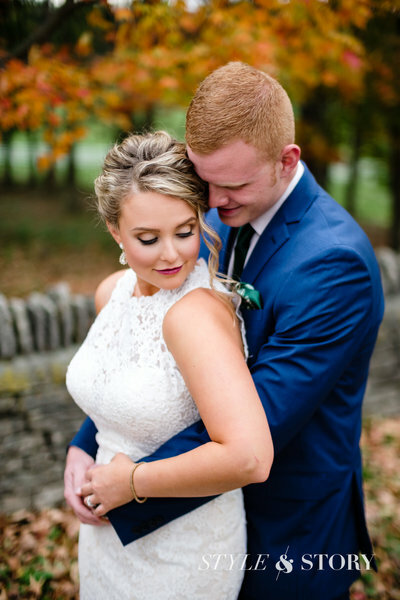 Located thirty miles outside of Columbus, IronGate Equestrian Center is one of the area's most unique wedding venues. Sprawled over 105 acres in the gorgeous countryside of Croton, IronGate Equestrian Center is a breathtaking display of natural beauty and beautifully-maintained buildings. 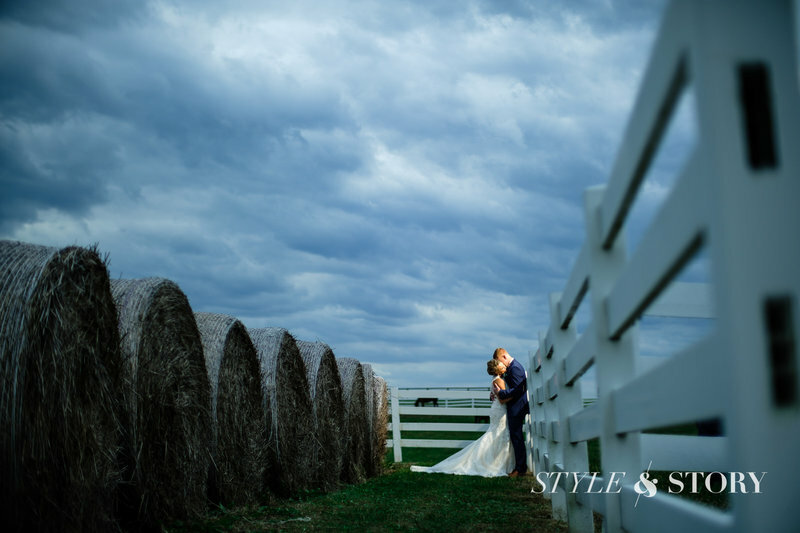 For those looking for one of the most idyllic and extraordinary wedding venues in the greater Columbus area, look no further than the IronGate Equestrian Center. Located thirty miles outside of Columbus, IronGate Equestrian Center is one of the area's most unique wedding venues. Sprawled over 105 acres in the gorgeous countryside of Croton.